Danya Malashenkov Synthpop The synthpop band Dusk to Dawn from Germany, was founded 1991, and have released 'Remains' their latest LP in late July 2012. This vinyl LP is seen as the perfect link between the two eras of Dusk to Dawn. From the start what a brilliant retro sound "Far Places" brings. Reminding me of the electronic art sounds of Jean Michel Jarre and Vangelis. Then so well this blends in with the following dark wave sound and vocals. Making for what becomes a catchy electropop track blended with dark wave. The sorrowful dark vocals are extraordinarily good matching the mood and sound perfectly. The synthesizer work and accompanying drums and keyboards are first class. "Ashes" has such a great melody and danceable beat, as the dark and mellow vocals make it sound so much like gothic synthpop, and again so very catchy. The overall sound reminds me of so much from John Leyton in the early 1960's, to Jonathan Richman and his protopunk sound of the 1970's, to Deine Lakaien. This is real quality which I can't fault. This time the track also features some nice guitar work and you will feel that the vocal lines really get hold of you. "Ride" provides a good bass driven guitar rhythm, and some lovely tones to match the ever mellow vocals, this time with a more haunting sound, which again won't let you go. The mellowness of the vocals is matched by the synth melody. Once again "Out of Sight" has the dark wave/synthpop combination with an element of futurepop, with essences of Ultravox, Depeche Mode, Flock of Seagulls and VNV Nation. Such a great combination of sounds but the vocals are as always what gives it that extra class. There is also very much a new romantic element shining through on this track too. The final track for the A side "Ways to Burn" has more of a ballad sound to it, nice catchy beat and good melody once again. The violins give it a more dark wave feel, the vocals are also hushed in places. Much more emphasis is place on the song and it has a folk feel. "Crawl" has a great synth and drums start. The vocals are so strong on this track, powering through it with the drums in support, both beautiful and melancholy. This has an "Echo and the Bunnymen" feel to it, and ethereal/gothic rock sound. In the end this one won't leave you alone. "Fatal Envoy" brings a faster and more dramatic sound, creating a more theatrical soundscape and reminds me once again of the works of Deine Lakaien. Elegant, dramatic and melancholic synthpop with a gothic rock feel and emotional and passionate beat. So much passion is apparent in "Where I Came From" from the very start. Once again the vocals power through the song with such fervor, capturing the listener in his passion and eagerness. Very much reminds me of The Chameleons and the days of listening to "Paper Tigers" and "Second Skin" and to other post-punk bands particularly Joy Division. We finish the album with "Separation", with its anthemic start dramatically changing to something much more blandly synthpop, and then to something of a synth-based alternative rock nature, reminds me of something The Cruxshadows might do. You could call it new wave pop but not my favorite track of the album by far but the fantastic vocals save the day. 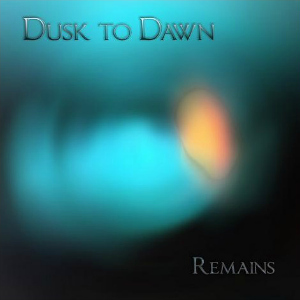 The synthpop band Dusk to Dawn from Germany, was founded 1991, and have released 'Remains' their latest LP in late July 2012. This vinyl LP is seen as the perfect link between the two eras of Dusk to Dawn. This album has a very nostalgic feel and also is available on vinyl. I also like that the band do not feel the need to release a CD version full of other artists remix work of their music. The sound maybe a hybrid and you could even call it gothicpop but it is also so pure and long may it stay that way. The songcraft of this album is outstanding, only just ahead of its music, but both complement each other so well. As for highlights I absolutely refuse to pick one as the whole album is a highlight. The album has a kind of Bauhaus effect, and once heard will stay with you forever.